It is not occasional anymore that the bad air is covering the whole land of Korea and people are sick and tired of it. Starting a day with fine dust and ultra-fine dust has been normal and people are expressing their anger to the government and demanding solutions. Experts say that fossil fuel as one of the main agents causing air pollution and new renewable energy is rising as alternative. 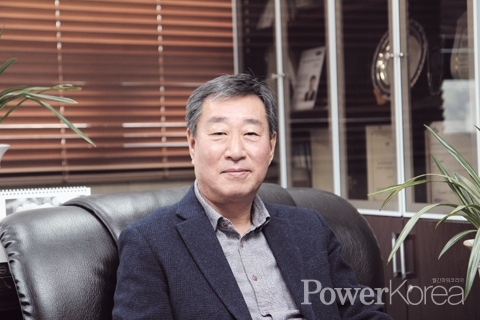 Noh Sung-mo, CEO of Allzin, has walked a single path as a solar energy specialist for the last 23 years and monthly <Power Korea> met him. New renewable energy can be solar energy and heat, wind power, geothermal heat, water power, water heat, ocean, hydrogen, fuel cell, bio, waste and coal. Since Korea depends on atomic power more than any other energy sources, it is urgent for the government to turn their eyes to new renewable energy for balanced growth. Allzin started its business with solar heat energy in 1995 and successfully turned it to solar farm in 2011 followed by heat pump thereafter. “Solar heat is affected by the price of oil while solar farm has average 30 years of lifespan with sustainable income by selling the generated energy to KEPCO. The equipment also doesn’t have faults or failure” explained Noh. 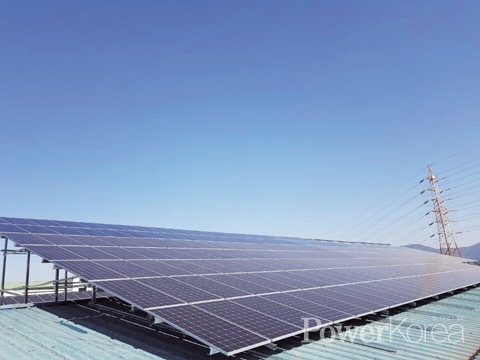 Solar farm industry in Korea has shown around yearly 30% growth since 2003. The source of energy is limitless and the generation system is semi-permanent and efficient. The Green Home project is one of the core projects of Allzin. The project goals to supply solar farm energy to 1 million households by 2020 and it comes with a government subsidy for installation. A solar farm-friendly house is a self-energy generative and gas, noise and vibration-free energy house. The electricity generated from the photovoltaic power station installed in the house is used to power the house and the owner of the house can transmit the extra electricity to KEPCO and get deduction up to that amount on the next electricity bill. An installation is consisted of three stages: ground work, construction and engineering. The ground work especially is the most important part as it has to lay the ground to hold up the solar farm for the next 30 years. The ground work has three methods: spiral, grouting and strip footing. Many companies tend to use spiral and grouting for cost-effectiveness but spiral is not solid and grouting can be unbalanced when used on poor ground. Allzin, on the other hand, only uses strip footing which dig the earth deep and connect the supports each other in line. It has good balance and is the safest although the coast is around 40% more; yet it saves maintenance fee. Thanks to its safety and sustainability, Allzin successfully drew US$11 million contracts in 2016, US$22 million in 2017 and US$44 million in 2018. It is notable that Allzin has installed 20,000 solar farms nationwide for the last 10 years. Meanwhile, as a man who values highly of CSR (Corporate Social Responsibility), Noh has donated part of his profits to the Hoi Scholarship Foundation in Chilgok County for many years.